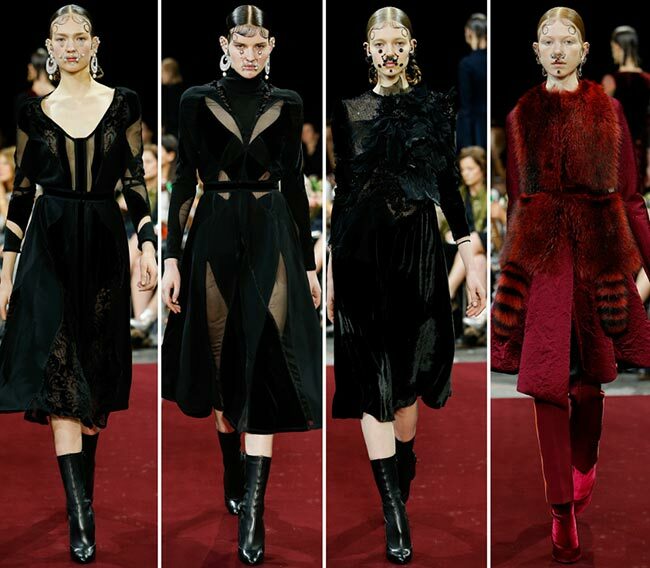 A luxury French brand known for its haute couture, Givenchy gave us a show that managed to scare us to the core. 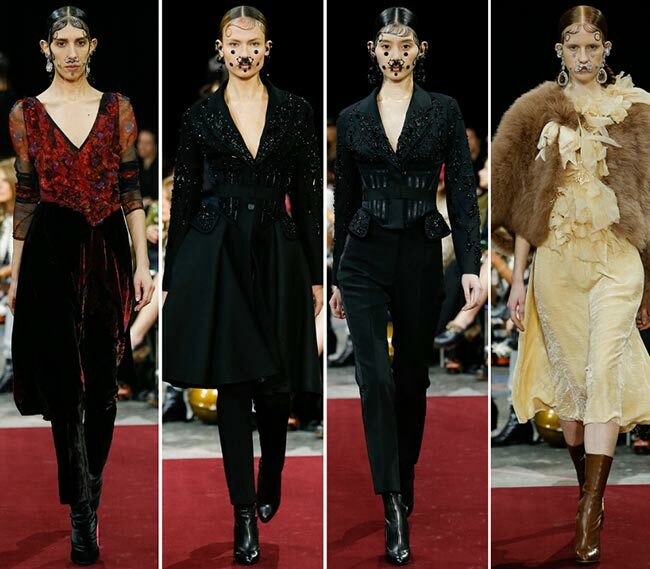 The beauty looks spotted at the Givenchy fall/winter 2015-2016 collection show seem to have been taken from a tribal tradition, where there are dots under the eyes and in the hollow under the lips, while the ladies seem to have piercings painted on all over the place on the face, a moustache and drawn on curling bangs finishing off the look. 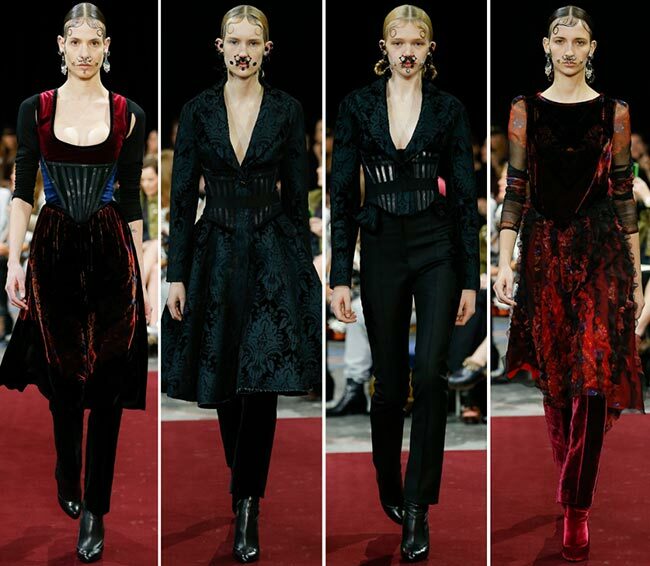 It is enough to give one nightmares really, but we somehow managed to look past that and focus our attentions on the “Adams Family’ style clothing that really reminds of Wednesday Adams. 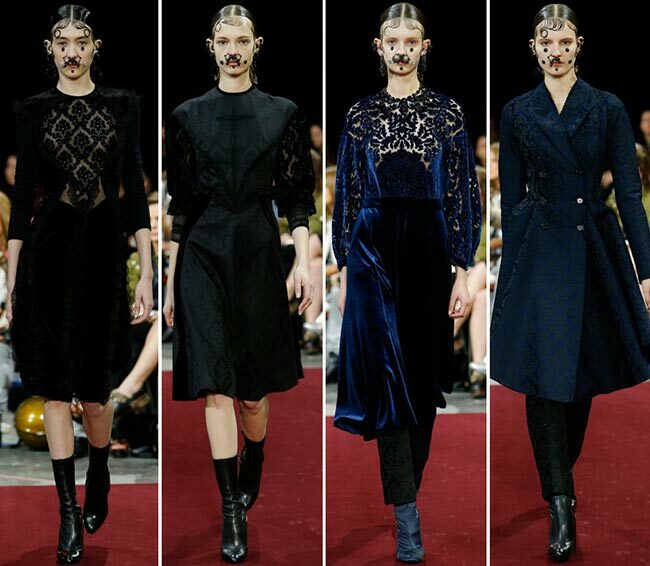 What with the pigtails and the black beginning, our minds had a hard time focusing on the rest of the collection at hand. 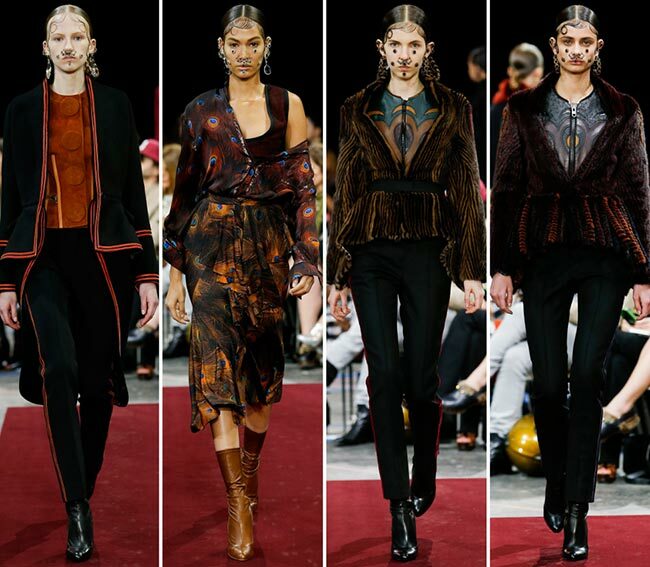 “Victorian-chola girl,” is how Riccardo Tisci described his Givenchy fall/winter 2015-2016 collection presented at Paris Fashion Week. Blue velvet and black lace, asymmetrical midi skirts and multiple layers, with trousers underneath the tops and skirts took over the runway. We soon ran into a few red hued strangely printed dresses with the chiffon on the arms and the velvet on the legs, the neckline as V or rounded and the looks not quite what we expected. 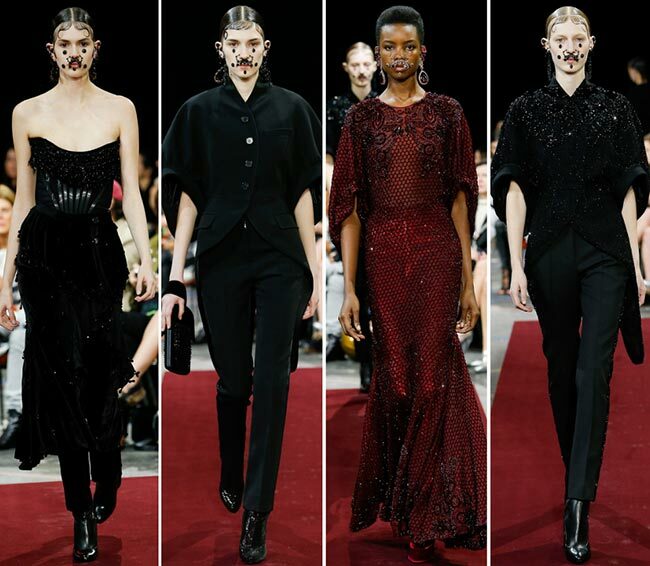 Givenchy has always been chic and sophisticated, but those are two terms that cannot be used with this collection for the most part. Alluring? Yes. Mesmerizing? Perhaps not always in a good way. Frightening? Slightly so. 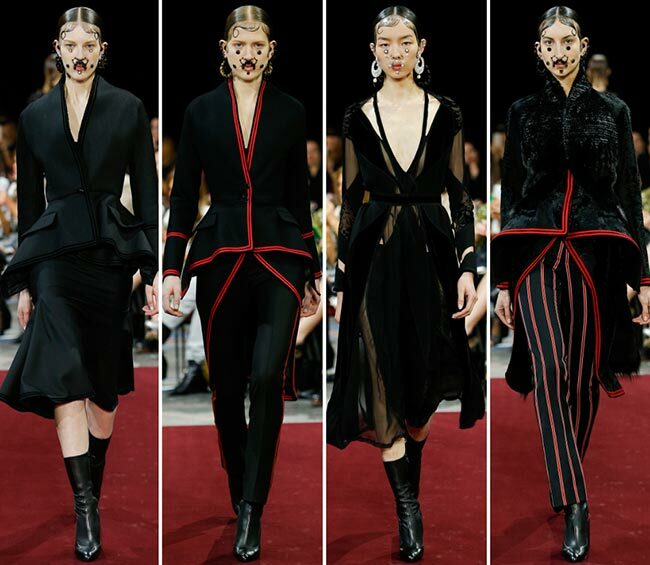 Yet we cannot state that what we are looking at is in any way, shape or form the Givenchy we have always known. The stars seem to have realigned for the brand and the haute couture seems to have seeped into the ready-to-wear fashions. There is something slightly Victorian about it all, if not a combo of bohemian and gothic. 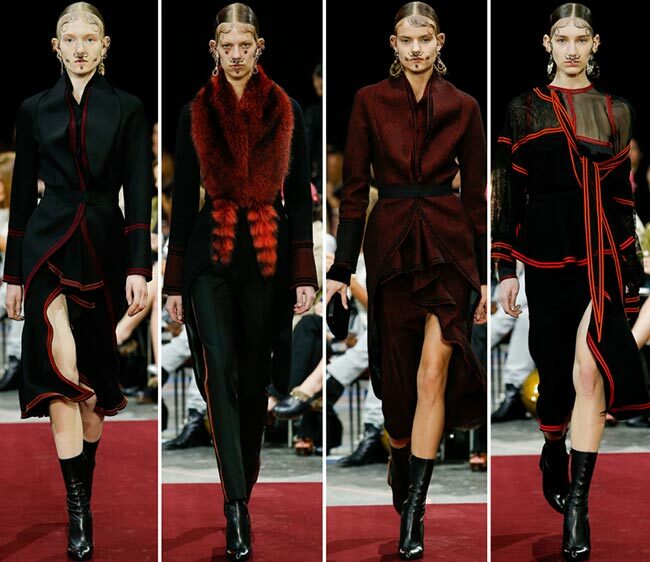 Between the black and the red hues in lighter and darker coloring, along with the single cream colored ruffled ensemble and the touches of brown throughout the collection, the palette used definitely attests to the bohemian Goth with a tinge of Victorian and a good amount of Aboriginal inspirations. 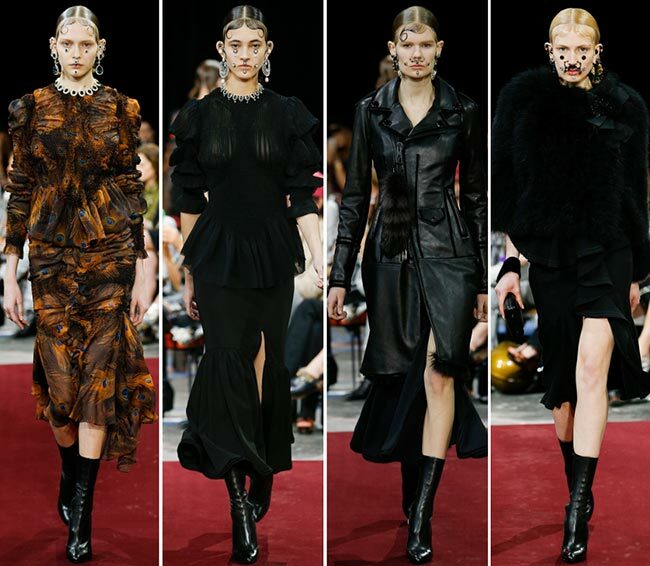 Feathery ruffles make their way into the Givenchy fall/winter 2015-2016 collection, while we find it interesting how most all of the skirt hems fall to the knees or just under. The boots are in black leather and come up to mid-calf. The tribal touch is rather real, what with the feather printed fur jackets, the peacock feather printed leather shirts, as well as the whole two-piece outfits. We do find ourselves facing a few of the season’s trends as well, though not nearly to the same extreme as with some other collections envisioned by their creative directors; here, we have the plunging V-necklines that do not plunge very low at all, we have the slits up the thigh that do not find their route to go too far high on the legs or fall to the center of the skirt and make it to the lower part of the thighs. We have the leather jackets that look rather lovely and we have the animal print with fur combinations that actually look pretty good! We even have the use of chiffon on some dresses that cover up the cut-outs beautifully, giving the look a rather intriguing edge.